The American people appear to be oblivious to the economic hurricane which is expected to touchdown in late 2007. That's when $1 trillion in ARMs (Adjustable Rate Mortgages) will “reset” triggering a massive increase in foreclosures and plunging the country into a deep recession. If energy costs continue to rise at the same time or if the dollar loses more ground, we may be rooting around in the backyard garden-plot looking for passed-over spuds and radishes. 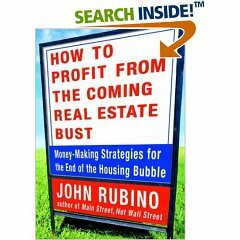 The crisis is entirely the work of Fed Chairman, Alan Greenspan, whose “cheap money” policy caused a speculative frenzy in the real estate market which sent home prices through the stratosphere. In fact, the bubble originated in 2001 when Greenspan lowered interest rates to a meager 1% and ignited a refinancing boom as well as a sudden up-tick in home sales. Now, after 17 straight interest rate increases, the bubble is quickly losing steam and the effects are being felt from sea to shining sea. Rest assured, the sudden downturn in the housing market is just the first gust from an impending tornado. By the end of 2007, America's match-stick economy will look like the rubble strewn landscape of New Orleans 9th Ward. Greenspan has been the biggest player in this pre-Depression operetta. He kept the printing presses whirring along at full-tilt while the banks and mortgage lenders devised every scam imaginable to put greenbacks into the hands unqualified borrowers. ARMs, “interest-only” or “no down payment” loans etc. were all part of the creative financing boondoggle which the kept the economy sputtering along after the “dot.com” crackup in 2000. It worked like a charm, too. Aided by the Fed's cheap money policy, the housing market sizzled. In just 6 years the total value of real estate jumped from $11 trillion to $21 trillion! (“From 2001 through 2005, outstanding mortgage debt rose 68% from $5293 billion to $8888 billion”) It's the biggest expansion of debt in history and it was all engineered by seductively low interest rates. Greenspan executed the swindle with the adroitness of a carnival huckster; luring millions of buyers to the real estate gold rush. Now, many of those same buyers are stuck with enormous loans that are about to reset at drastically higher rates while their homes have already depreciated 10% to 20% in value. This phenomenon of being shackled to a “negative equity mortgage” is what economist Michael Hudson calls the “New Road to Serfdom”; paying off a mortgage that is significantly larger than the current value of the house. The sheer magnitude of the problem is staggering. “About 2.2 million borrowers who took out sub-prime loans from 1998 to 2006 are likely to lose their homes”. In real terms, that translates into roughly 10 million people! 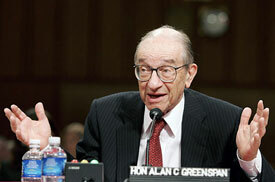 Greenspan, of course, nodded approvingly while the new regime of shaky lending practices was being put into place. What really mattered to the Fed-chief was making sure the economy could be kept on life-support while the massive “unfunded” tax cuts were provided for his well-healed buddies in corporate America and while the country charged off to war in Iraq. Greenspan knew that his “low interest rate bonanza” was driving the wooden stake into America's heart. In fact, every banker understands the effects of interest rates; it's fundamental to their trade. Lower the interest rates and the people will swarm to the banks like piranhas to a hambone. It never fails. The housing bubble has nothing to do with “market forces” or (Gawd help us) supply-and-demand. That's all gibberish. Low interest rates provide a channel for pumping cheap money into the economy which inevitably creates equity bubbles. When Greenspan lowered rates to 1%, he knew that he was simply trading a technology bubble for a real estate bubble. Now, of course, he has retired before the wheels fall off the cartso he can avoid being blamed for the coming catastrophe. The fallout from the housing explosion will be much more destructive than what most people imagine. In fact, Peter Schiff, president of Euro Pacific Capital Inc. believes that the NY Times' estimates are too optimistic. Schiff anticipates that failures in the sub-prime loan market will put greater downward pressure on housing by increasing inventory and lowering prices. “The secondary effects of the “1 out of 5” sub-prime default rate will be a chain reaction of rising interest rates and falling home prices engendering still more defaults, with the added foreclosures causing the cycle to repeat. In my opinion, when the cycle is fully played out we are more likely to see an 80% default rate rather than 20%”. 40 million Americans headed towards foreclosure? Better pick out a comfy spot in the local park to set up the lean-to. Why indeed? There's simply no incentive to hang on to a home or condo that's losing value every day. “For the majority of homeowners, they are now ‘lobster potted' for the rest of their lives in the 21st Century's version of the Victorian treadmill. Welcome to modern debt-controlled serfdom, where if you lose your job, either through retrenchment or illness, you lose your home. It has become a veritable Sword of Damocles, or a stick with which to beat recalcitrant labor into a bloody pulp, should they ever prove restless or disobedient. The ruthless and faceless plutocrats who benefit vastly from this dreadful scheme must be laughing on their return to a status of demagogic power which is the modern equivalent of Roman or Medieval Aristocracy at its exploitative worst…. The first wave in the tsunami is timed to hit in late 2007 when $1 trillion in ARMs reset; wreaking havoc across the country. That means that millions of borrowers will see dramatic increases in loans on homes that are of steadily-diminishing value. (Many monthly payments will nearly double!) The number of foreclosures will skyrocket, unemployment will soar, and America's consumer economy will swoon. How will we make up those losses in employment? If homeowners can't tap into their equity to augment their stagnant wages, GDP will shrink and investment will flee to foreign markets. That's when we're likely to see the lines at the neighborhood shelter winding around the block and whole families camping-out in the backs of their Suburban's. A “96% of the purchaser's monthly income”?!? That leaves a measly 4% of one's earnings to pay for clothes, food and other essentials! The disaster in sub-prime loans is leading the housing market into a waterfall-type decline. It's the first indication that a real catastrophe is just around the corner. The inability of over-leveraged borrowers (many with a poor credit history) to meet their obligations is spreading to other areas of the market. This is called “contagion”. The defaults are symptomatic of a larger problem which could quickly affect the entire system. Why should this matter to the average homeowner? Because in 2003, 35% of all mortgages were “nonconforming” loans. In 2004, it went up to 59%; and in 2005, nonconforming loans were a mammoth 65% of all mortgages! As the lenders return to more conventional practices the pool of potential customers will dry up accordingly and housing prizes will fall precipitously. Once again, we need to remind ourselves that the housing boom was not created by market forces, “real demand” or increases in wages. It is entirely the outcome of Greenspan's “cheap money” policy (low interest rates) as well as the widespread shabby lending practices. (“Creative financing”, ARMs etc.) These factors have caused the largest expansion of personal debt in history and are creating a real risk of a complete financial collapse. So, why would the banks commit to such a risky scam when the standard criterion for loaning money has been understood for hundreds of years? For the banks to ignore the rules for prudent lending (20% Down-payment, fixed interest rate, sufficient collateral and income) is like a scientist saying that the rules of gravity no longer apply or that the chemical composition of water has changed. It simply makes no sense, does it? “Cheapening” the dollar by doubling the money supply paves the way for hyperinflation and (the Fed believes) a more competitive American workforce going nose-to-nose with competitors in China and India. It's a plan that globalization's foremost champion, Tom Friedman, would probably greatly admire. By pulverizing the dollar, the Fed can crush the middle class and lay the foundation for a “class-based”, police state; Bush's nascent Valhalla. The first step to “reordering” society is destroying the currency. Jefferson understood that monetary policy is central to the maintenance of personal freedom and should not be ceded to a few “unelected” and unaccountable men whose interests diverge from the public good. The Fed's ability to “inflate and deflate” the currency allows privately-owned banks to decide the country's future and remake society according to their own inclinations. America's political transformation is being engineered by the Federal Reserve. But, what about the banks? What would compel the banks break with traditional lending practices and put themselves at risk of millions of foreclosures? Unfortunately, the terms of the MBS allow non performing loans to be sold back to the lender that originated the loan. Now that the number of “non-performing” loans is on the rise, (through defaults) the banks are scrambling to avoid liability. (In fact, according to National Mortgage News, Fifth Third Bank is “selling $11.4 billion in securities (almost all MBS) before year-end 2006 and is taking a loss of approximately $500 million.) This reflects the new mood in steering away from shaky loans. As the great housing Hindenburg continues its downward trajectory, the banks will undoubtedly do their best to prevent the deluge of foreclosures (and failing MBS') from dragging them under. Perhaps, they will offer more flexible terms to over-leveraged homeowners as a way of recouping their losses; it's impossible to know. It's also hard to gage how many struggling homeowners will be able to hang on even with a more flexible payment schedule. Unfortunately, the present trend-lines offer little reason to be hopeful. These are grim times for the mortgage industry and we shouldn't be too surprised if one or two major banks hobble into receivership before the storm is over. Translation: The worst is yet to come. The number of homes sold in November was the LOWEST IN ALMOST 4 YEARS” causing inventories to swell to a “7.7 month supply, the highest since December 1995”. These are very bad numbers. So, why is the media cheering? The media is no more dependable in their coverage of the housing bubble than they are about Iraq. The reader must do his own research and draw his own conclusions. But one thing is certain, house prices are way beyond any historical relationship to rents or salaries. They are bound to come down… and fast. The real estate slump will seriously dampen consumer spending and further shrink the already miniscule US GDP (1.9%) This will undoubtedly have the added effect of curtailing foreign investment; putting more downward pressure on the floundering dollar and triggering a round of hyperinflation. Ultimately, the Fed will be forced to make one of two choices; either lower interest rates and forgo foreign investment ( $2.5 billion a day) or keep interest rates where they are and accelerate the collapse of the housing market. There is no “third” option. No doubt, Fed-master Bernanke will work towards that goal by keeping the printing presses humming-along while praying for the elusive “soft landing”. The Fed's plan to reshape American Democracy: "One bubble after another"
That shift in wealth is underway even as we speak. These massive equities bubbles, (stock market and housing) which have had such a devastating effect on working class people are the predictable result of a class-based orthodoxy. They inevitably widen the chasm between rich and poor and strengthen the power of the ruling elite. It is crazy to think that they are merely “accidental”. The upcoming recession is the direct result of policies which originated at the Federal Reserve and which were intended to create a crisis. It is a clear attempt to change American societyon a structural level by exacerbating the divisions in wealth. The expansion of debt invariably strengthens private ownership and enhances corporate profits. It also weakens democratic institutions and national sovereignty. As millions of people lose their homes and life savings from the crashing of Greenspan's Housing Bubble, we should reconsider Wilson's words andmake a concerted effortto dump the Federal Reserve.